We are the leading manufacturer, supplier & exporter of Sterling Silver those are made by unique style and design. These Designer Ring are provided by us at reasonable rate and according too the specification of client. 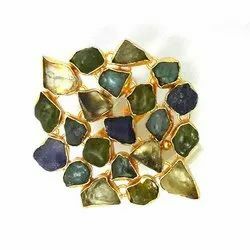 Our jewellery is made using natural stones therefore, the stones may slightly vary in shape,colour, and size. We are offering our clients an eye-catching and amazing range of Silver Rough Stone Jewellery. It catches the interest of everyone looking for perfection with sophistication. This jewellery is carved out in the latest pattern that separates it from other artificial jewellery items. Need another ring size? We would love to re-size it especially for you. Please mail us before purchasing any different size rings. Every order is shipped during the next 5-7 working days after the order has been placed. 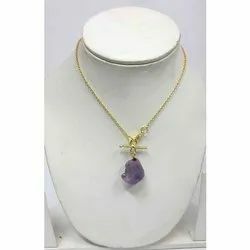 This is a breathtaking Amethyst stone Pendant Necklace electroplated with micron Rose gold on the sides and bottom of the stone. It has beautiful, sparkly hues of rich purple and has a substantial weight to it. Amethyst is believed to have energy powers of healing, power and protection. It correlates to Zodiac signs Pisces, Aries, Aquarius & Capricorn. The sides and back of the amethyst cluster are smooth. The chain and spring clasp are both Gold micron Plated. Raw Citrine & Raw Amethyst Bracelet - Rough Uncut Gemstone Bracelet - Gold Vermeil Bracelet - High Finish Bracelet - Gemstone Bracelet. Need another size? We would love to re-size it especially for you. Please mail us before purchasing any different size. 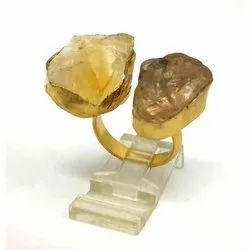 Unique Ring, Yellow gold Vermil Ring, Rough stone jewellery,Brass Ring, Cocktail ring, Amethyst Ring, Citrine Rough Ring, Handmade Ring. The Stones will be different in each pair. These are about 3" long including the hooks. Thank you for looking! Raw Cage earrings, Rough stone Earrings, Gold Vermil earrings. We are manufacturers, wholesalers, exporters and suppliers for 925 Sterling Silver Jewellery Stone Studded Jewellery. 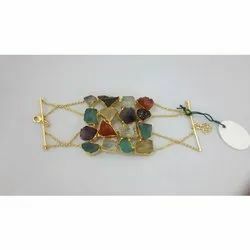 We make Rings, Earrings, Necklaces, Chandeliers, Bracelets lot more. Attached are few of our designs in silver jewellery with images so that you can have an idea about our craftsmanship, finishing and exclusivity. 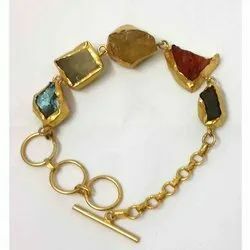 We are the manufacturer and supplier of Rough gemstone jewelry. 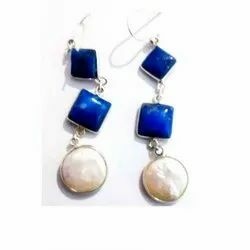 We make Rough stone earrings, gemstone earrings, blue sapphire earrings, emerald earrings, ruby earrings, gemstone bangle jewelry, Natural bangle jewelry, fashion bangle jewelry, fashion earrings, fashion bracelet, fashion necklace, fashion pendant, ruby earrings, diamond earrings, diamond gemstone earrings, Labradorite earrings, diamond opal earrings, diamond stud earrings, gemstone diamond bangle, gemstone dangle earrings, gold earrings, sterling silver dangle earrings, gemstone diamond bangle etc. Due to our huge knowledge and expertise in this domain, we have been able to present an outstanding range of Fancy Blue Ear Tops to our valued clients. 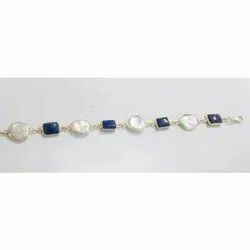 We are one of the renowned firms, engaged in offering an extensive assortment of Fancy Bracelet. These are made as per present market demand.